Growing beans in your vegetable garden doesn’t have to be tackled by only those with experience. It may seem challenging at first, but growing beans actually is quite easy. As long as you know and provide the basic requirements for growing these crops, you’ll soon enough find yourself reaping the wonderful, rewarding bounty. Beans prefer warm weather and shouldn’t be grown in cooler climates. These crops should be grown in sites receiving full sun in well-drained, fertilized soil. Preparing the soil with compost and manure before planting is highly recommended. Beans should not be planted until all danger of frost has passed, usually about a week after the last frost in spring. Beans come in numerous varieties consisting of both bush and pole types. Deciding what variety of bean you want to grow and whether to grow the bush or pole type plant is important when you are planning your garden. Green beans are probably the most widely grown in the vegetable garden. They adapt quite well to a variety of soil types, provided the location is in an area with good drainage. They are also available in both bush and pole types. When harvesting green beans, pick them once they have reached adequate size but do not allow them to over ripen. When they’re too ripe, the pod becomes too tough and the bean will taste bitter. Yellow beans only come in the bush variety. They are quite similar to green beans in all aspects with exception to taste and tenderness. Lima beans, or butter beans, come in both bush or pole varieties. These beans are flat and rounded with a very distinct flavor. Lima beans should be planted a week or two later than other garden beans. Shell beans, or dry beans, come in a wide variety and typically are grown for the bean inside. Dry beans usually take longer to mature and are best when grown in warmer climates. Navy beans are the most commonly grown dry bean. Black-eyed peas, or cowpeas, are frequently grown for the bean inside as well and are common in the South. Soybeans are extremely nutritious, which makes them quite popular for growing. Peas are highly nutritious, tasty, and easily grown. Peas are more preferable in cool weather climates and should be planted early. Most beans combine well with other crops that are grown in the garden; for more successful results growing beans, you’ll need to choose the proper variety and follow the growing requirements that are suited to your particular area. Beans can be planted in hills or rows depending on your individual landscape needs, personal preference, and the type of beans grown. Bush beans are the easiest to grow, growing in the form of small, bushy plants, which are close to the ground. They need no support, require little care, and can be picked whenever you are ready to cook or freeze them. These types of beans typically produce an earlier crop; therefore, successive plantings may be necessary for a continual harvest. When bush beans are planted in hills, they should be about an inch deep and approximately 2-3 inches apart. For rows, plant the beans at the same depth with spacing about 18-24 inches apart. Once the seedlings begin to develop true leaves, the plants can be thinned to 6 inches apart. If the area you are in stays quite humid, allow more space between the plants for better airflow. Pole beans are known as vine-growing plants and will grow nearly anywhere. 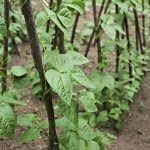 These types of beans require staking with supports that can be derived from items such as bamboo, string, a fence, trellis or ladder. Sunflowers or corn stalks can also be used for bean supports. Pole beans can be planted in hills or rows as well with the same spacing and thinning as bush beans. Before you plant, however, it helps to incorporate the staking support of your choosing for the beans to climb on once they have reached adequate size. Growing pole beans gives you the advantage of maximizing your space, and the beans grow straighter and are easier to pick. Beans are susceptible to a variety of insects with beetles being the most common; these insects can easily be picked off by hand or sprayed with soapy water. Excessive heat and humidity can cause a variety of disease problems in beans. The more common of these diseases are bacterial or wilt diseases, but there are numerous varieties of beans available that are disease tolerant.